If there’s one thing I love about my job is to discover new watch brands. I’m always stunned by the level of creativity infused by independent watchmakers, from the Sci-Fi creations of Urwerk or the ultra-classic propositions of Laurent Ferrier (who can do nice things together…) One brand we recently discovered at MONOCHROME cumulates quite some intriguing specificities. It isn’t Swiss, but it makes things in an ultra-traditional way, whether for the design or the manufacturing process, and it’s all about one-off pieces. 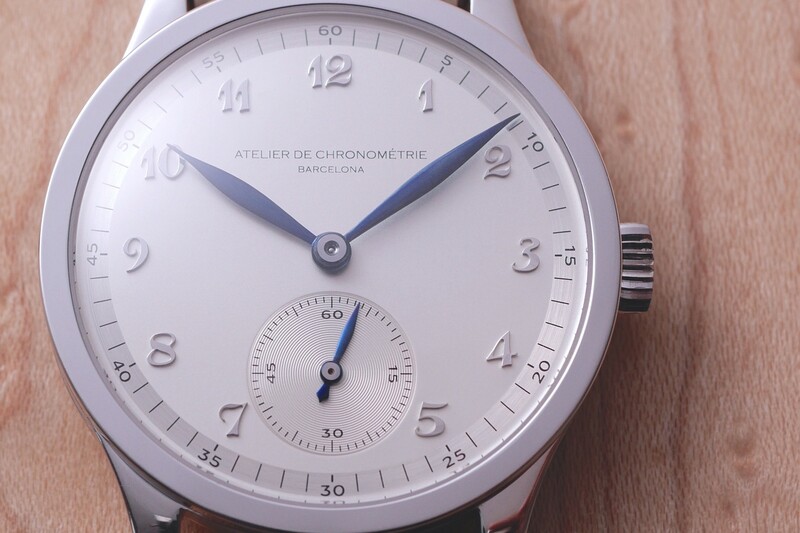 This brand is Atelier de Chronométrie and their latest creation is the AdC #5, which brings back to present times the superb 1940s design and mechanics. 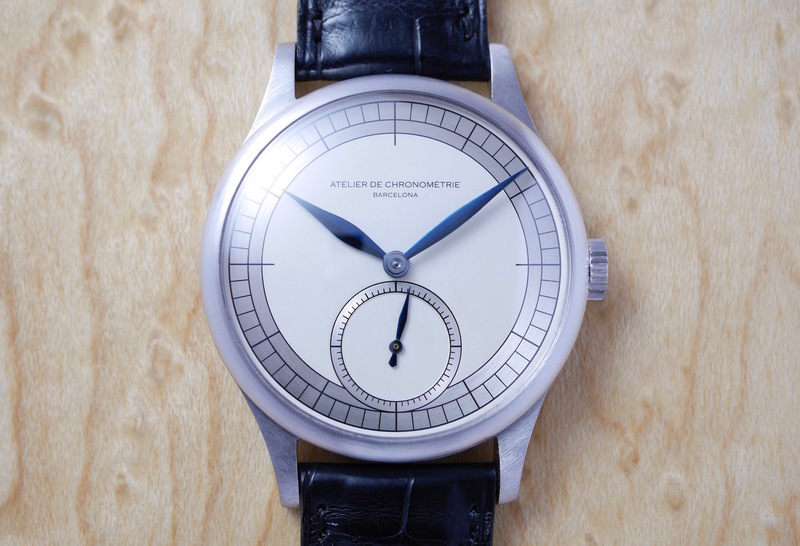 The philosophy of Atelier de Chronométrie is to create one-off watches with the pure aesthetics of the 1930s and 1940s, in a package that is not infused with modernism. 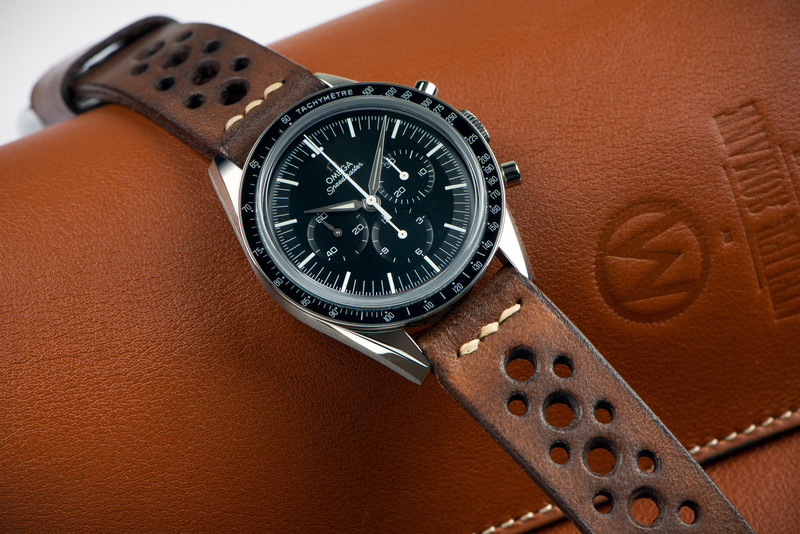 Behind this brand, there’s no idea of vintage inspiration or reeditions of glorious models with modern mechanics or modern techniques. The sheer beauty of Atelier de Chronométrie sits in the fact that not only are the design and inspirations from the inter-war period but, for our biggest pleasure, everything from the way their watches are manufactured to the movements that power them is historically relevant. This Barcelona-based brand (indeed, far away from the Swiss mountains) creates unique watches by hand – and when they say by hand, it means without the use of modern machines, such as CNC. Moebius Rassmman, a watchmaker with more than 20 years of experience, and Santiago Martínez, a collector and vintage watch dealer expert in Patek Philippe, the two co-founders of Atelier de Chronométrie, only use traditional design cues, traditional manufacturing processes and use vintage Omega movements, entirely restored and remade, to power their watches. Relevant, from A to Z. 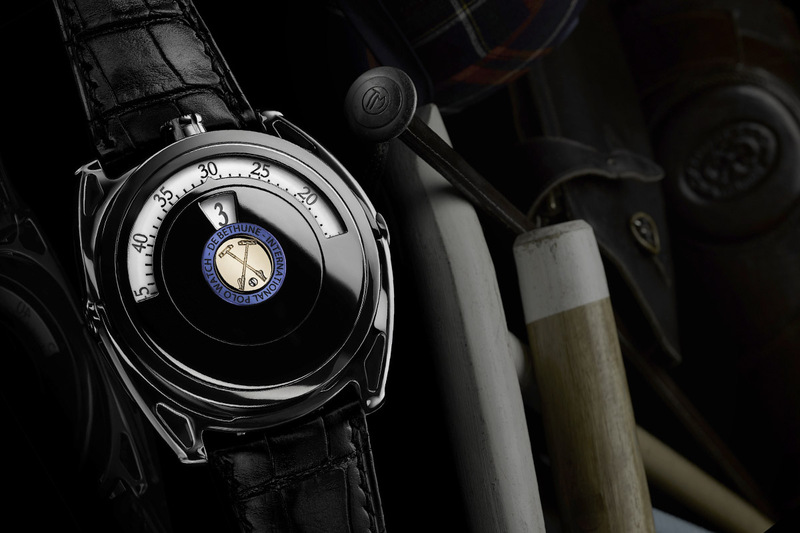 Considering this flexibility, they have been creating watches only made to measure at the buyer´s request. Customers can choose from unlimited options such as the case material, the type of dial design and a wide range of choices to customize the calibre. 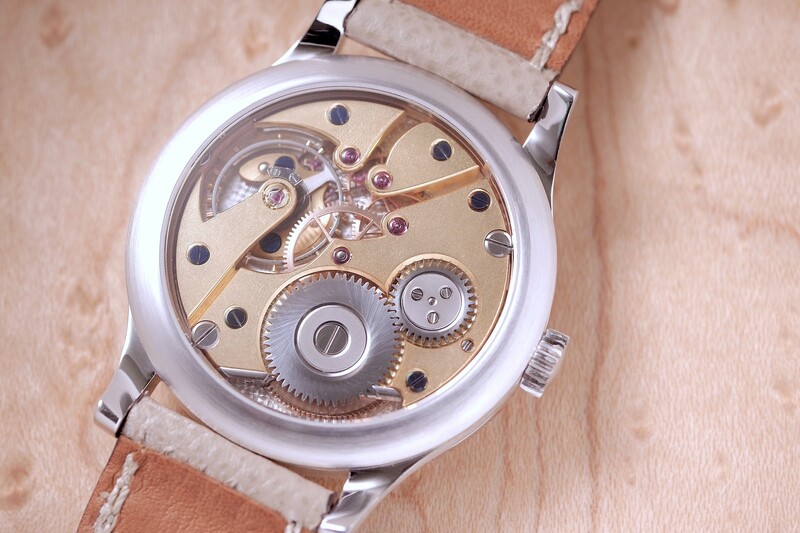 Each wristwatch is a one-off piece, designed exclusively for the customer and never repeated for any other. Thus, the watch that we’re about to show you is indeed creating a new collection for the brand, it could be considered as a base for future unique creations. Like all the creations of Atelier de Chronométrie, this new AdC #5 is fully inspired by 1940s watches, with a strong Patek Phillipe influence1. Compared to the previous watches they have manufactured, this AdC #5 is presented in a very clean style, emphasizing two specificities: the applied Breguet numerals and the blued steel hands – two features that are clearly dear to vintage collectors. 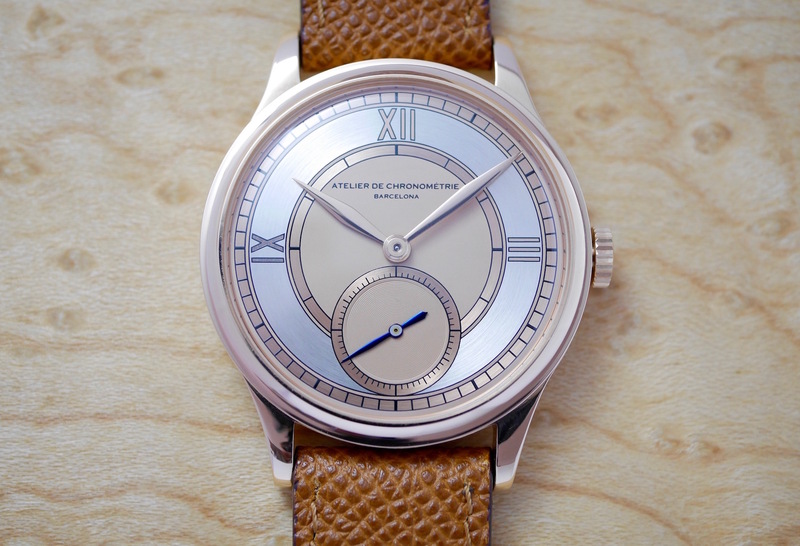 The present Atelier de Chronométrie AdC #5 – don’t forget that this is a one-off piece – is presented in a 37.5mm case, the standard size for the brand, yet as always, the diameter can be adjusted from 35mm to 38.5mm on request. The 18k white gold case is shaped in the most traditional Calatrava/coin-edge style, a design made famous by Patek Phillipe in the early 1930s, which combines a central part with integrated lugs and a flat, angular bezel on top. As a more luxurious and slightly dressier version, this AdC #5 is polished on the upper parts, yet it will be easy to ask for brushed surfaces all around. The dial of the Atelier de Chronométrie AdC #5 follows the same idea, with a two-tone silvered plate on which are applied some raised Breguet numerals. Combining a circular-brushed minute track with a matte central area and a small second with azurage (concentric pattern), time is indicated by 3 completely handcrafted blued steel hands with a classical leaf shape. The contrast with the metallic dial and numerals is superb and the execution, as always with this manufacture, is impeccable. 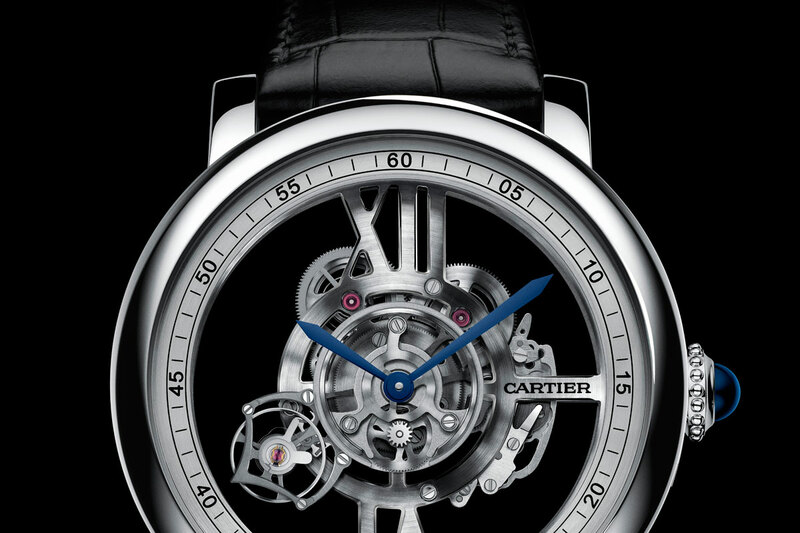 The pièce de résistance of this watch sits under the sapphire caseback. To power the 3-hand display is a historically relevant movement, an Omega Calibre 266, a variant of the highly respected Omega 30T2 calibre. 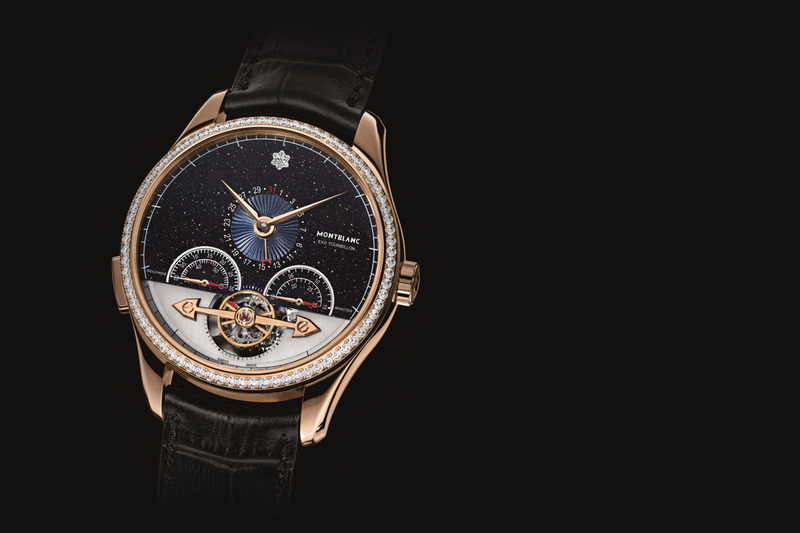 Yet, the team of Atelier de Chronométrie didn’t just oil and service the movement. What they’ve done is create a proper Haute-Horlogerie movement based on this Omega Calibre 266. All the plates and bridges are replaced by internally hand-crafted parts, done without the help of CNC machines. The movement is here presented with 18k yellow gold plating on the 4 bridges, blued screws and 18k pink gold plated and rhodium plated accents. All in all, 21 pieces are replaced and completely remade, specifically to create the movement of the Atelier de Chronométrie AdC #5. Other parts are entirely reshaped and refined to fit the high-end concept. 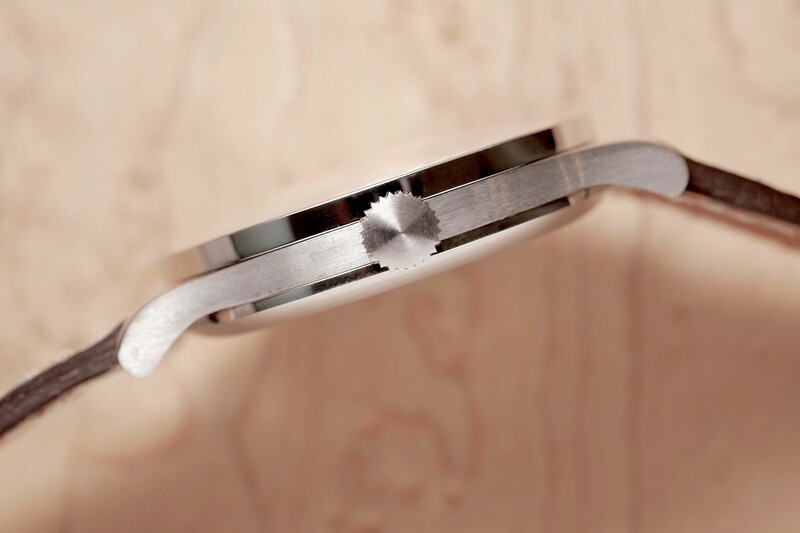 The finishing and decoration include hand-made frosting on the bridges and plates, double snailed finishing with a matte finished centre on the ratchet wheel and the ratchet click, hand-made anglage on the bridges, including inward angles, bevelled wheel spokes and polished countersinks. The shape of the bridges is also completely different from the original Omega vintage calibre, and its specifications have been improved too, with the addition of a free sprung balance regulated by inertial screws or a KIF anti-shock system. The Atelier de Chronométrie AdC #5 is another extremely refined and subtle piece, which has clearly been made for the most mature collectors. Its beauty is discreet and maybe hard to get for more novice enthusiasts, especially knowing the approximate EUR 40,000 price (depending on the options chosen of course). Steep indeed but this feels justified by the amount of hand-work done here. More details on www.atelierdechronometrie.com. When one thinks at this price point a Petek would be one of their mass made pieces with a huge amount of automated finishing and not to the standard of their more expensive range or a Rolex DD which is pretty much all automated or factory line assembly then this wonder suddenly seems quite reasonable in comparison! 40000 euros…Tears flew from my eyes, becoming from loud laughs…. It is a copy of Longines 1945, a good, nice and cheap watch. Allow me to answer though. 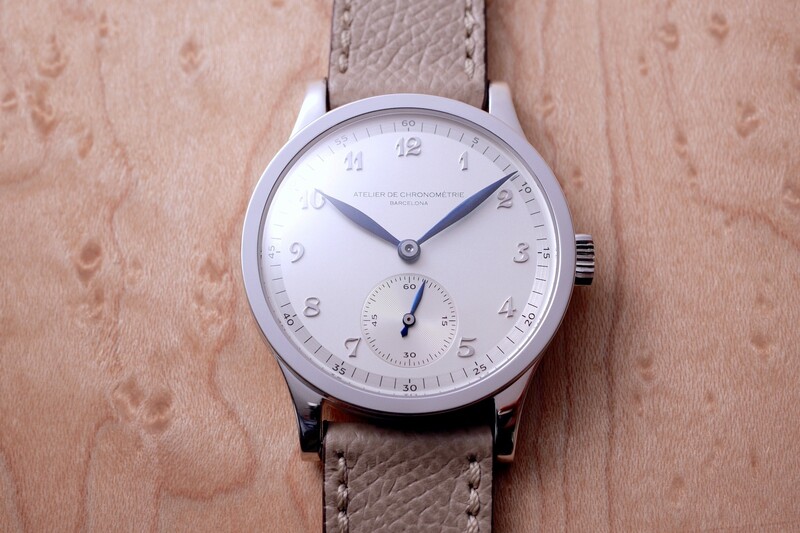 I do agree with you that the Longines 1945 is a very nicely designed watch, deeply inspired by the 1940s and the “Calatrava Style” – something that this AdC also shares. 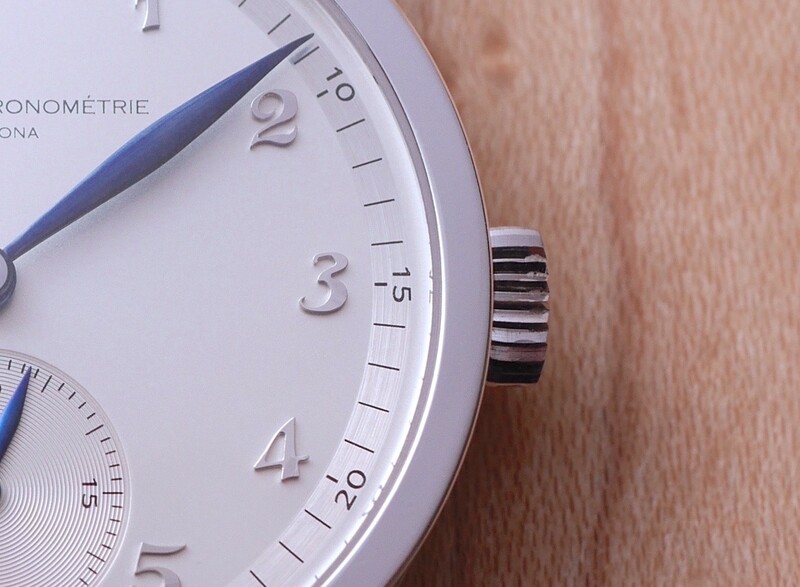 With the AdC, you have a watch that is entirely crafted by hand, with no machine, which requires weeks to achieve. 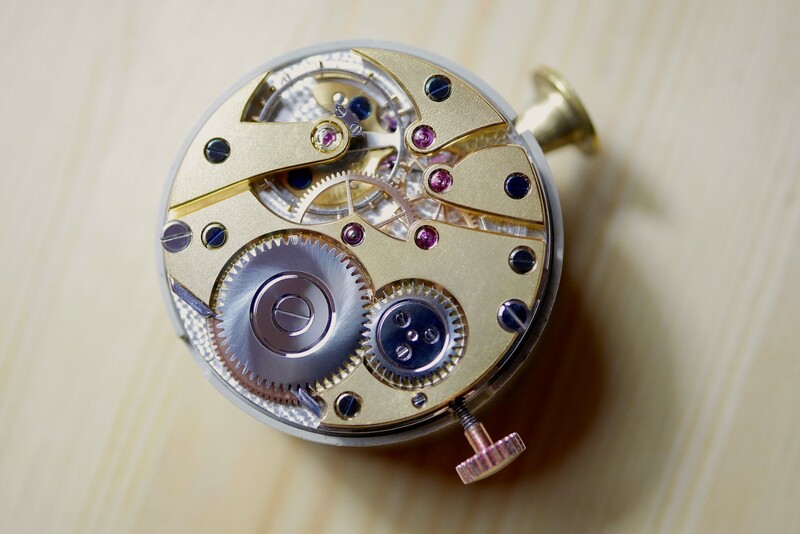 In addition to that, each watch is unique and customized to the client’s desires… Meaning that every part has to be manufactured especially for one and only one watch. Nothing against the Longines, once again a very nice and friendly priced watch. But these two are clearly not playing in the same league. Hope this will help you to understand why one comes for less than EUR 2,000 and the other for EUR 40,000. 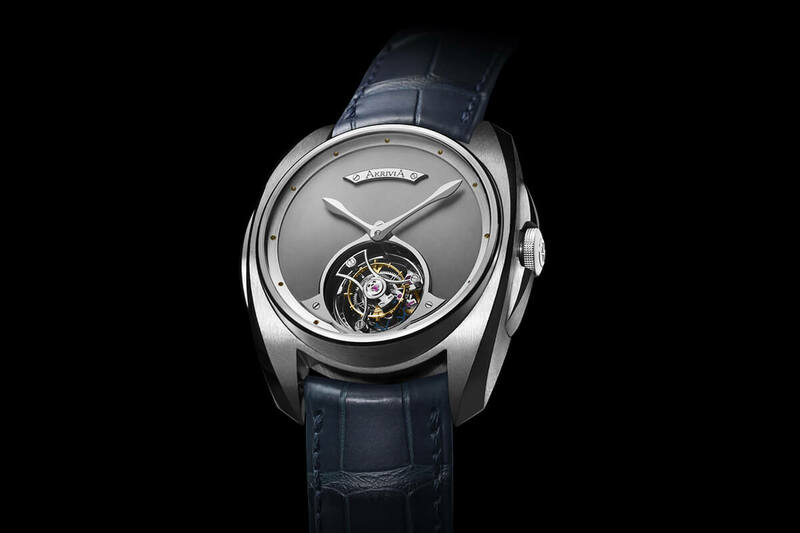 I was reading Brice’s answer to DocJ and then I started to laugh, because trying to justify charging CHF 40 K for Quote designed watch, deeply inspired by the 1940s and the “Calatrava Style” Unquote, is a joke. For that kind of price, one should expect to get at least some degree of originality. For much less one can buy the real thing, say a vintage PP Calatrava ( preferrably in 39mm ) , instead of paying a fortune for a deeply inspired ( I prefer to use the word “copy” ) timepiece that may the good lord help the buyer if he ever needs to repair it. I believe Mr Bertoli is unused to true luxury.